Interests:IH tractors & Equipment, particularly the letter series. Hey, 2+2s are pretty awesome too! IH Cub Cadets, 1X6/7 series. Model Railroading. Pre 1980 Schwinn bikes. Steam locomotives/trains. Nice set up! Even nicer hat! Do you have a spring assist on that? Yes and the hat is more indestructble than the tiller and just as old. The hat has been worn every winter. The tiller has had several vacations. Well I'm disapointed. 60 views and not one comment on the outboard rotor bearings. Or the pulley on wrong side of chaincase. Is no one using these anymore? Interests:All International Harvester build products, cadets, farm equip., trucks, light industrial equip., hobby farming, lots of gardening, finding, using and refurbishing anything IHC build in my time, my wife, kids and 10 grandchildren. Yes it runs backwards. The reason was to get away from the push-pull effect. Perhaps it wasn't as noticeable with a gear drive but with a hydro that sod would have been nearly impossible. Drawbacks it is real easy to stall tiller. Belts fiddle string tight can hardly work engine at all. Tends to lift and leave trash on top. It's not going back. Ha-Ha. My tractor show buddy and his wife came over for supper one night 35+ yrs ago, brought his 317 Deere and tiller over to till up wife's garden. I had a Canadian thistle that was 4 ft tall that I chopped off before he got there. When he hit the roots to that monster the tiller raised the back of the tractor close to a foot off the ground and about 2-3 feet ahead in the blink of an eye. 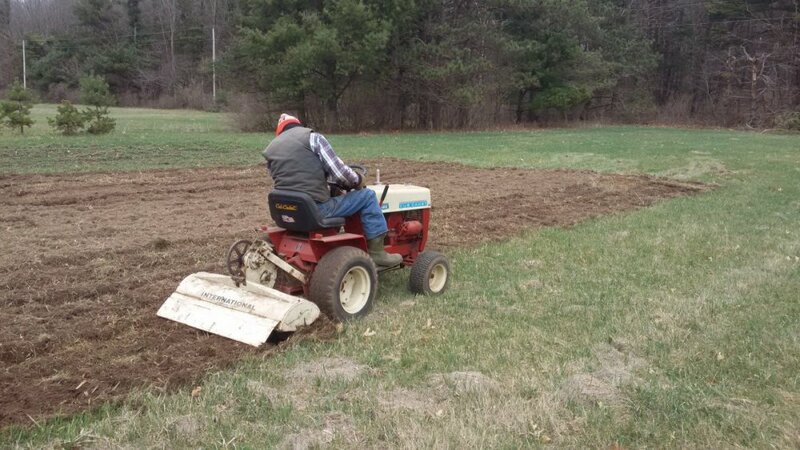 I tilled Dad's garden a time or two with his Cub Cadet 129 and tiller. I think moldboard plowing then tilling is actually faster. 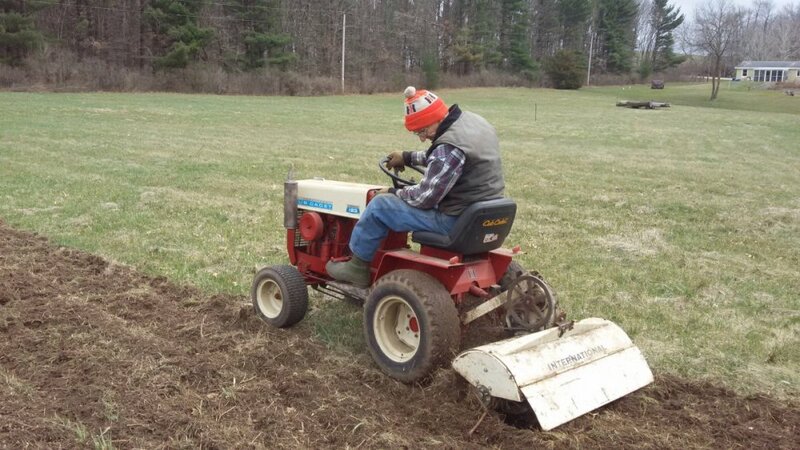 I know my sister-in-law never declined my offers to fall plow her huge gardens years ago. I'd do her gardens, then Dad's as he only lived 4-5 miles away. Mold board plowing 20 year old sod like this it would have to be disked before you could till it. With these counter rotating tines I was able to work my way through a patch of multiflora rose roots and bring up the roots of two saplings that had been mowed off. Yes tractor plow and disk is quicker. Getting tractor out of barn and hooking up plow would have burned more fuel than I used and it was fun.